Young Max is the last member of his family who still believes in Santa Claus and the magic of Christmas, but when taunted and mocked by friends and even family, he turns his back on Christmas. Unfortunately for Max’s family, and the whole neighborhood apparently, Krampus is coming this year and he’s bringing a bag of tricks and his mischievous helper elves. Does Max’s family stand a chance with all of their in-fighting and lack of holiday cheer? Or can Max get what he truly wanted, a merry Christmas with a happy family the way they used to be. For those unfamiliar with Krampus, he is a European figure from Alpine Folklore. Described in the film as “the shadow of Santa Claus” he is sometimes posited as either a helper of or an oppositional figure to Saint Nicholas. Although in all accounts, Krampus is there to punish those who are wicked or misbehave while Santa Claus delivers gifts to those who are good. Krampus is the second feature film directed by Michael Dougherty, the first being 2007’s cult hit Trick ‘r Treat, and it is very obvious that Dougherty is one of the best storytellers working in film today. 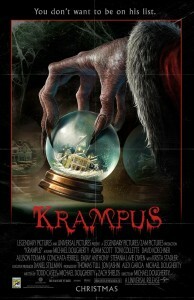 While the script combines elements from different Krampus legends and incorporates some ideas of its own, the outcome is a terrific and funny film with heart and characters that the audience actually cares about. The movie features strong acting all around with leads Adam Scott, Toni Collette, and David Koechner providing wonderful performances, but it is worth noting that all of the child actors, such as Emjay Anthony (Max), were impressive in their roles and really carried that film at times. Krampus also features a wealth of fantastic effects, provided by Weta Workshop, from the evil toys, to the elves, and especially Krampus himself. There is no lack of great creature effects. Between its creatures, atmosphere and creepy Christmas score by Douglas Pipes, it is easy to see why Krampus was such a big hit in its opening weekend. I certainly loved Krampus and highly recommend that you catch it while it is still in theaters. Michael Dougherty has already made one film that quickly became a Halloween holiday tradition for many and I believe he has done that for a second time with Krampus. I will definitely be revisiting this film year after year at Christmas. If you love having a scary good time with a few laughs, you should check out Krampus immediately.